My favorite color is orange. I used to think my favorite color was hot pink. Then I thought it was blue. Then purple. Even turquoise is still in the running somedays. But overall, most of all, orange is it. It's such a bright, happy color. 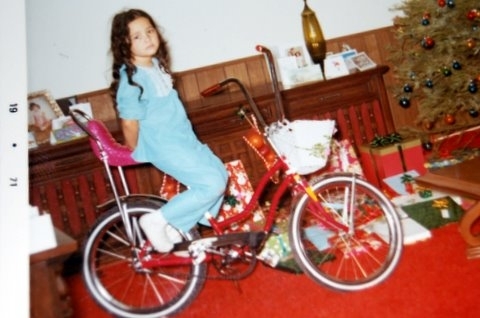 My first car was an orange Dodge Charger (think Dukes of Hazard). I think I had an orange corduroy bedspread when I was in Jr Hi (matched my Shaun Cassidy posters on the wall). My mom sent me this family picture today. 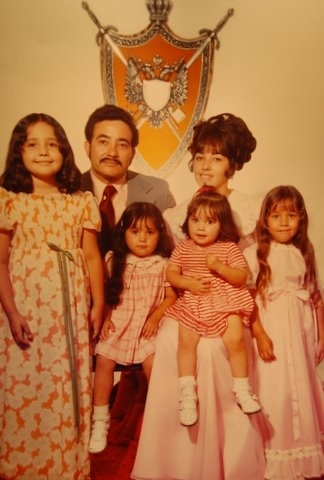 Notice the carefully coordinated outfits...long pink chiffon gowns, pleated organdy dress, pink dress shirt on my dad with burgundy tie...then there's my favorite dress of all. My orange dress. My grandma made it for me. I especially loved the long, green bow at my waist. I vaguely remember my mom wanting us to all have matching outfits on for our family portrait. But I really was determined to wear my favorite dress. And in the end, it turned out OK because I match the lovely family crest hanging above the fireplace. Does Anyone Recognize This Couple? 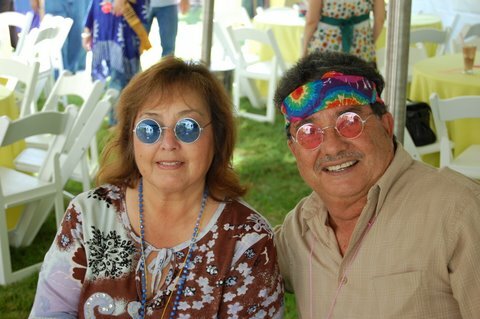 My parents went to a '60's birthday party on Saturday night. They didn't mean to dress up, but the hosts thought of everything so they handed out Lennon glasses and headbands and peace necklaces at the door. Sounds like they had an awesome time. I vaguely remember the '60's, having been a mere infant during that time. My parents are picture-takers - they have albums and slide shows full of pics of us. And so when I visit them, I can step back in time to the '60's, '70's, & '80's and really feel the clothes, hair, cars, homes, etc. The first 10 years (or more) of my life I always had a book in front of my face, (usually Nancy Drew or Trixie Belden) so my true memories are rather blurry but thanks to the photos, I can remember so many more of the details. Keep on snapping those photos - I can't even remember what I wore yesterday most of the time!